Solution: a homogeneous mixture of two or more substances. Solute: that substance which is the smallest amount, or a substance with the ability to be dissolved. Solvent: that substance which is the maximum amount, or a substance with the ability to dissolve. Concentrated solution: a solution with a large amount of solute. Dilute solution: a solution with a very small amount of solute. Saturated solution: a solution that nothing can be added to and dissolve. Soluble: something that is able to dissolve. Insoluble: something that is not able to dissolve. Miscible: something that is able to mix with another substance. Hydrolysis: the breaking apart of a substance with the use of water. Salt: a solid substance containing a metal and a non-metal. Colloid: a particle suspended in a solution that is able to reflect light. Titration: to ascertain the quantity of a given constituent by adding a liquid reagent of known strength and measuring the volume necessary to convert the constituent to another form. Polarity: the positive or negative state in which a body reacts to a magnetic, electric, or other field. Dilution: making a solution with a lower concentration. Dissociation: when a substance dissolves and breaks down into elements. Equilibrium: the condition existing when a chemical reaction and its reverse reaction proceed at equal rates. Compound: a substance made up of two or more elements. Endothermic: a chemical reaction that uses heat. Exothermic: a chemical reaction that produces heat. Hydrophilic: having a strong affinity for water. Hydrophobic: having little or no affinity for water. Precipitate: a solid that is produced when two solutions react. Residue: a solid left behind. Product: a substance obtained from another substance through chemical change. Reactants: any substance that undergoes a chemical change in a given reaction. Hydrate: any of a class of compounds containing chemically combined water. Suspension: the state in which the particles of a substance are mixed with a fluid but are undissolved. Basic: a substance with a pH higher than 7. Neutral: a substance with a pH of 7. Acidic: a substance with a pH lower than 7. Supersaturated: to increase the concentration of a solution beyond saturation using heat. Concentration: a measure of the amount of dissolved substance contained per unit of volume. Current: movement of charged particles. Conductivity: the property or power of conducting heat, electricity, or sound. Combustion: chemical combination attended by production of heat and light. Reduction: the process or result of reducing. 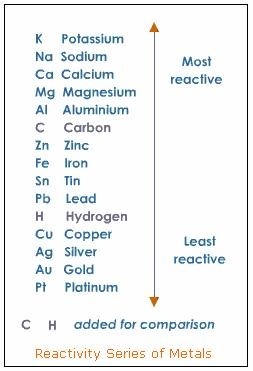 Oxidation: the deposit that forms on the surface of a metal as it oxidizes. Element: one of a class of substances that cannot be separated into simpler substances by chemical means. Molar mass: the mass of a molecule in grams per mole, the sum of the component atomic masses; molecular weight. Molarity: the number of moles of solute per liter of solution. Diffusion: the movement of a solute from a region of high concentration to a region of low concentration. The solute moves down a concentration gradient. Self-ignition: something that is able to spark or ignite without a flame. Aqueous: of, like, or containing water. Electrolyte: any substance that dissociates into ions when dissolved in a suitable medium or melted and thus forms a conductor of electricity. Strong acids: Hydrochloric acid, sulfuric acid, nitric acid, phosphorus acid. Weak acids: Sulfurous acid, citric acid, acetic acid, carbonic acid. Strong bases: Sodium hydroxide, calcium hydroxide, potassium hydroxide, lithium hydroxide. Weak bases: Magnesium hydroxide, aluminum hydroxide, copper hydroxide. Carbonate: a salt or ester of carbonic acid. Anode: the positive terminal, electrode, or element of a battery that attracts the anions. Cathode: the negative terminal, electrode, or element of a battery that attracts the cations.